Scope and Content Clachnaharry Sea Lock, Caledonian Canal, Inverness, Highland, from east This shows a boat docked in the sea lock, built between 1810 and 1811, with the Beauly Firth in the background. The two-storeyed lock-keeper's cottage (left) has single-storeyed extensions at the gables and an entrance porch which has a piended (hipped) roof. The lock gates (right) are surmounted by a railed pedestrian walkway. The original lock gates were constructed with Welsh oak because it was more resistant to salt water. These gates lasted for around 80 years but were replaced by new gates built from oak and steel between 1890 and 1906. The lock gates were fully mechanised by the mid-20th century. The lock-keeper who was employed to open and close the lock gates would have occupied the cottage, along with their family. The Caledonian Canal was designed by Thomas Telford (1757-1834) and built between 1803 and 1822 at a cost of £840,000. It was the first example of a transport network funded by the government in Great Britain. 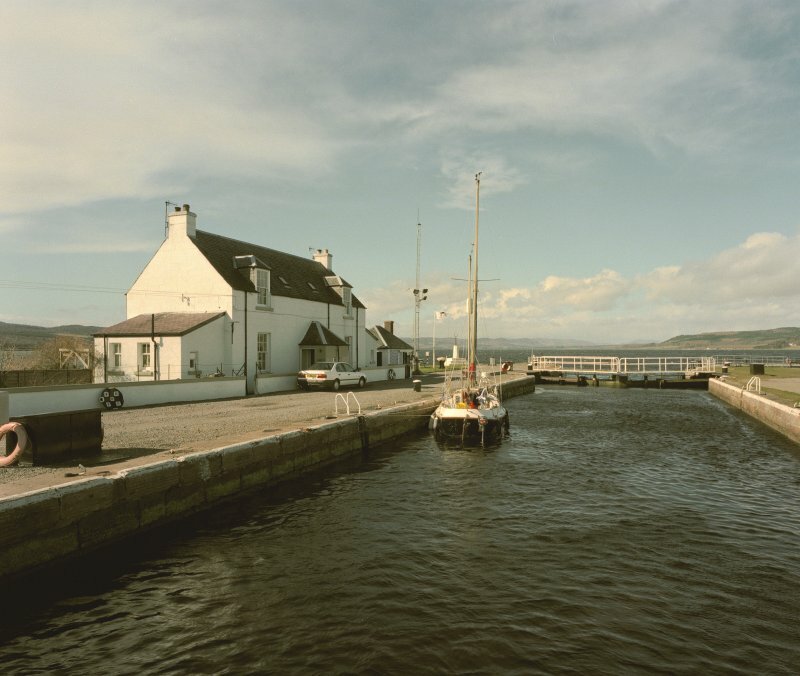 The 96.5km-long canal provides a route for boats travelling between the North Sea and Atlantic Ocean as it runs from the Beauly Firth at Clachnaharry, Inverness, to Loch Linnhe at Corpach. Only 35.4km of this length is man-made while the other 61km runs through four lochs: Loch Dochfour, Loch Ness, Loch Oich and Loch Lochy. Unfortunately at 4.2m deep the canal was too small for most sea-going ships which led to it being altered and deepened between 1844 and 1847. Source: RCAHMS contribution to SCRAN. >>>> Item Level (SC 799636) Inverness, Clachnaharry, Caledonian Canal, Clachnaharry Sea Lock View of the Sea Lock taken from the top lock gates, showing a yacht moored to one of the bollards. The bottom lock gates are clearly visible, as is the Beauly Firth beyond.